Norrsken: CyclooPS' background - where does the project idea come from? CyclooPS' background - where does the project idea come from? 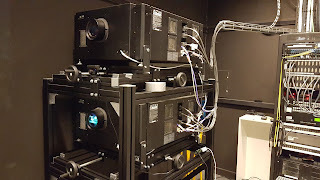 VIC Visualization studio at KTH, Sweden has a system with a 180 inch 4K screen, which is back-projected by two JVC D-ILA 4K projectors. Projecting onto a glass screen as in this technological solution cannot deliver touch-functionality without additional technology. 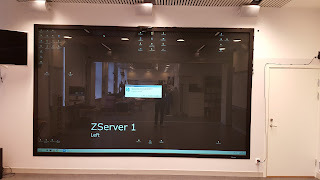 Touch functionality on a screen of this size is very interesting for demonstration purposes in several different fields. The main purpose for the visualization studio is to amaze visitors by demonstrating state of the art technology, something which could be achieved with a responsive touch system on the 4K 180 inch screen that creates an impressive visual (or other) feedback. Therefore, with the addition of an EyeToy camera stationed behind the screen, is it possible to track touches carried out by the users. The so-called TUIO API in turn handles the touch interaction and passes it on to e.g. Unity or some other system that can make use of the input. The reason that the touch interaction has not been showcased to studio visitors before, is mainly that the applications created for the system have been lackluster. The applications that utilize the TUIO system have not delivered visual (or other) feedback that is, simply put, good enough. The VIC Visualization studio features an 180 inch 4K back-projected screen. When the studio is showcased, it is custom that we discuss the technical possibility of using the 4K screen as a touch screen. Currently, the studio cannot actually show the touch possibilities as there is no interesting and stable system to showcase it. The idea is to use one or several EyeToy camera(s) to capture the backside of the screen by tracking black blobs that appear when the screen is touched by the user(s). At the moment, when guests arrive at the studio, they are greeted by a 4K slideshow. We aim to replace this, or add to this by developing an aesthetically pleasing graphical system. The main goal is showcasing the visual brilliance of the screen as well as the interesting idea of a touch-screen of this magnitude. 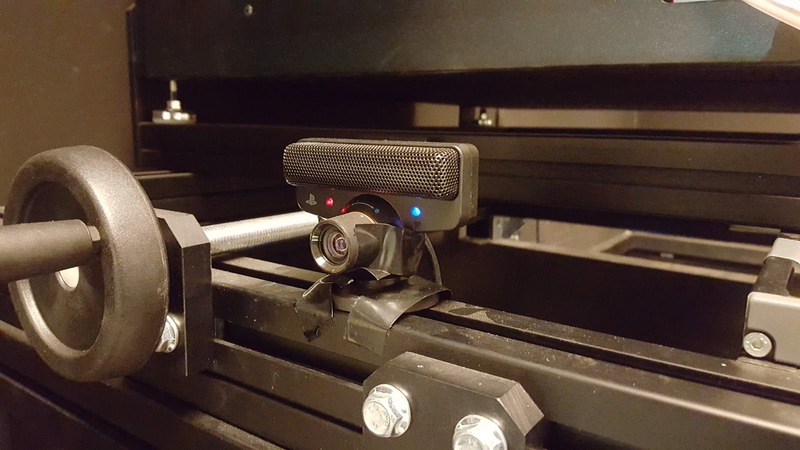 There already exists a plugin for Computer Camera Vision and TUIO for Unity, which makes this game engine the obvious choice. Scripting language will be C# as we have previous experience. Graphics will be done in OpenGL with vertex and fragment shaders. The server we are building the project on has an older graphics card which supports up to DX10. Thus, compute shaders are not an option.